It was a great effort by Black Tomahawk , at only his second run back from a spell, to find winning form at Bendigo on Sunday. Sharing the prize in the Jayco Handicap over 1600m, the five-year-old improved off a tardy start to sit fourth on the rails and after hitting the lead at the 200m fought the race right out. In doing so recording the third success of his 12 start career, Black Tomahawk rewarded his connections (led by breeder Sylvia Mooney) who have been very patient with the slow maturing son of Seul Amour. "They have been very patient," Michael Moroney said, "and hopefully they will now get rewarded." "He has always shown a fair amount of ability and he still has plenty of scope for improvement." Hopefully our winning run continues into the week though we have only a few runners starting with Nordic Duke who heads to Canterbury on Wednesday. Hard fit for recent racing and coming off an encouraging Hawkesbury third - running on strongly from the rear - the Viking Ruler gelding looks close to a win. 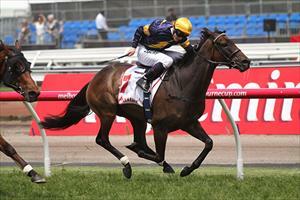 "The track is rated a heavy 8 which is going to suit him," said Moroney. "He has good heavy track form in New Zealand and he is in a race where a lot of the others are unproven in such conditions." "It is a pity that he keeps drawing out but it is the last race so hopefully the track will be playing to the swoopers by then as he will have to go back from that barrier." We also have two runners at the Sale meeting on Thursday, the first of which is Saint Or Sinner who is topweight in a heat of the Winter Championship. Down in class after a Gr.3 seventh at Morphettville, Saint Or Sinner was, says Moroney "a bit disappointing." "He loomed up but didn't quite round it off," he said, though noting that the race may have not been run to suit. "They ran fast early sectionals and slowed down late which may explain his run." "On his best form he should prove hard to beat on Thursday, he has topweight because he is the best horse in the race and with the emergencies out he comes into barrier three which is ideal." Hopefully we are cheering on a running double with Bonnie Belle making her Australian debut in the following race. "She is a really lovely filly," Moroney enthused, looking forward to seeing the daughter of Keeper bring her good New Zealand form to Melbourne. "She is still a bit on the big side and will improve upon whatever she shows first up but she has been given time to mature and she should really start to show what she is capable of." "She has had a couple of jump-outs here and performed really well."